The final six players in the $300 Mega Stack Challenge came to an agreement on a chip equity chop. 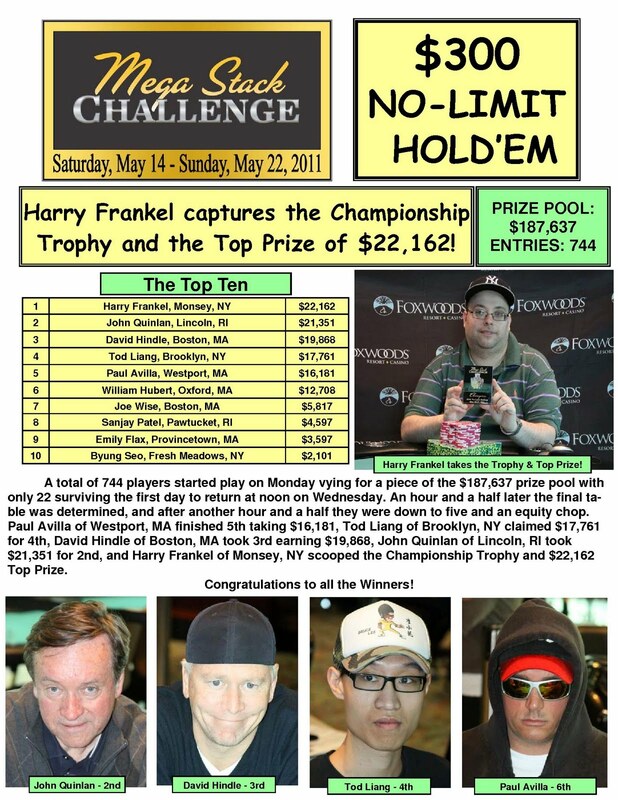 Harry Frankel is officially the champion of the event and takes home $22,162 and the trophy. The board ran out [9d][5h][2d][Qs][Kc] and Quinlan caught a king on the river to win the pot. Joseph Wise was eliminated in 7th place for $5,817. The turn brought the [3h], giving both players a flush but Frankel's king high flush left Patel drawing dead. A meaningless [9c] fell on the river. Sanjay Patel was eliminated in 8th place for $4,597. The board came [Ts][4s][2d][3d][Qd] and Avilla paired his queen on the river to take the pot. Emily Flax was eliminated in 9th place for $3,597. The board ran out [9s][8s][3d][2d][As] and Quinlan won the pot with a pair of aces. Byung Seo was eliminated in 10th place for $2,101. A monster pot just went down at the live stream feature table. Three players were all in before the flop holding [Ah][As] vs. [Kc][Kh] vs. [Kd][Ks]. The player with the aces had both players covered and the flop came down [Td][Th][9s]. The turn was the [Qd] and both players holding the kings started yelling for a jack. The dealer put out the river card and it was the [Jc]. The table erupted in shock as the players holding kings caught runner runner for a straight to chop the pot and stay alive with only 15 players remaining. Day 2 of the $300 Mega Stack Now Streaming Live! Day 2 of the $300 Mega Stack Challenge is now underway. The blinds are starting off at 12,000-24,000 with a 4,000 ante. With 22 players remaining, the average chip stack is now 507,000. There are 22 players remaining and the average stack is 507,000. 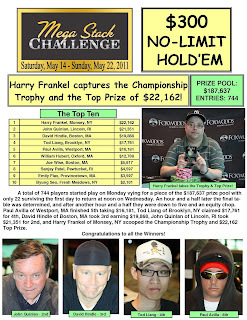 End of Day 1 chip counts and Day 2 seating assignments will be posted as soon as they are available. Play will resume tomorrow at noon EST.